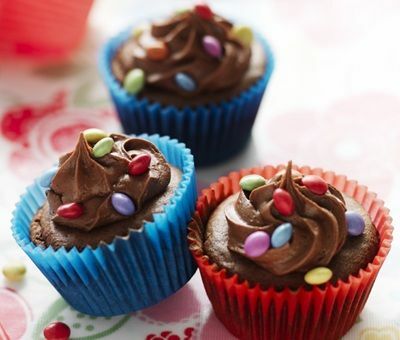 Try these simple cakes out with any mini-chefs in the household and have fun decorating with chocolate beans. They're perfect for birthday parties too! 1. Preheat the oven to 180°C, (160°C for fan ovens), Gas Mark 4. 4. When cool, beat the icing sugar, cocoa powder, buttery baking spread and vanilla with enough condensed milk to make a thick icing. Spread or pipe onto the cakes. Finish with a few mini chocolate beans! Look out for other fun ways to decorate your cakes – try edible glitter, sugar shapes or sprinkles. My girls and I love making these cakes. We use various sweets for the topping. Hi Louise! Another budding baker in the making then! Hope you love the Banoffee Pie too! Very simple to make. Too much cocoa powder in the bun mixture - I would use half in future and the condensed milk in the icing makes it too sweet. Also use less cocoa in the icing. Perfect for bake-a-cake day :) and so easy! So easy to make, even with lots of little helpful fingers! We didn't get the icing quite right but it didn't spoil it too much!